LOS ANGELES, CA--(Marketwired - Jul 23, 2015) - Studio 77, a newly constructed apartment community in Northern Hollywood, will begin preleasing in the upcoming months. 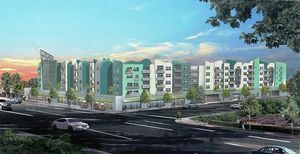 This 156 unit community is located in the heart of the Noho Arts District and scored a walkability rating of 90%, neighboring several shops and restaurants. Studio 77 is at the intersection of Noho, Studio City, and Universal City, with doorstep access to Lankershim Blvd. Amenities include a resort-style pool and spa with cabanas, a skydeck with mountain views, in addition to a movement/yoga studio. Each unit will be equipped with GE stainless steel appliances and quartz countertops, while main living areas will include hardwood style flooring. Studio 77 offers 11 distinct floorplans including studio, one bedroom, and two bedroom options. The community will be managed by Lincoln Property Company, the nation's second largest multi-family manager. Mary Missirilian, Lincoln's Regional Marketing Director over California, stated, "Studio 77's location in the Noho Arts District is ideal. Paired with its high end amenities, Studio 77 should be a sought-after community. We're eager to start preleasing so our residents may experience smart living in the heart of it all." Lincoln Property Company was founded in 1965 as a builder and operator of high-quality residential communities. In the early 1970s, Lincoln expanded its product mix to include commercial, build-to-suit, office, hotel, industrial, and other mixed-use assets. In 1972, Lincoln took this expertise within the United States to Western Europe and the Middle East.